Did You Forget What Marvel's Secret Wars Was About? Let Us Remind You! Marvel finally did it. Eight months after it began, Secret Wars came to a close today, after nine issues of reality-bending madness. No idea what the fuss is? Want to get in on the event that brought us an All-New Marvel universe, juuuust as it’s ending? What the hell happened to the Fantastic Four? Here’s our guide. Just a warning, going in—we’re not going to be spoiling the final issue of Secret Wars #9, which was released today. But obviously, plot points from the first 8 issues of Secret Wars, by Jonathan Hickman, Esad Ribic, Ive Svorcina, and Clayton Cowles, will be detailed below. You’re been warned! So. Secret Wars. Didn’t that happen in like, the ‘80s? It did! The 2015 series shares its name with the classic Marvel “event” series that took place in 1984. The new Secret Wars only really shares a name and the concept of the “Battleworld”, which all 9 issues of Secret Wars and its various spinoff series took place on. We’ll get to that, first, you have to deal with the Universe exploding. Okay, let’s actually dial it back a little bit further, because Secret Wars is essentially the culmination of a plot that’s been swinging around in writer Jonathan Hickman’s New Avengers comic series. Basically, the New Avengers—Captain America, Tony Stark, Reed Richards, Namor, Doctor Strange, and Black Bolt—faced a terrible battle. Parts of Marvel’s various alternate universes were smashing into each other, creating “Incursions” that essentially destroyed either one of the universes or both in the process. The Avengers had to be willing to do anything to stop that happening to their own reality. It was very dark—Hickman’s New Avengers saw some of Marvel’s greatest heroes sacrifice a lot to ensure the safety of their universe. They erased Steven Rogers’ memory when they decided they needed to go beyond Cap’s moral code. They kept a woman from an alternate universe captive. Hell, at one point they actually destroyed another universe to save the main Marvel reality. In the end, even these heroes sinking to their lowest didn’t save them. 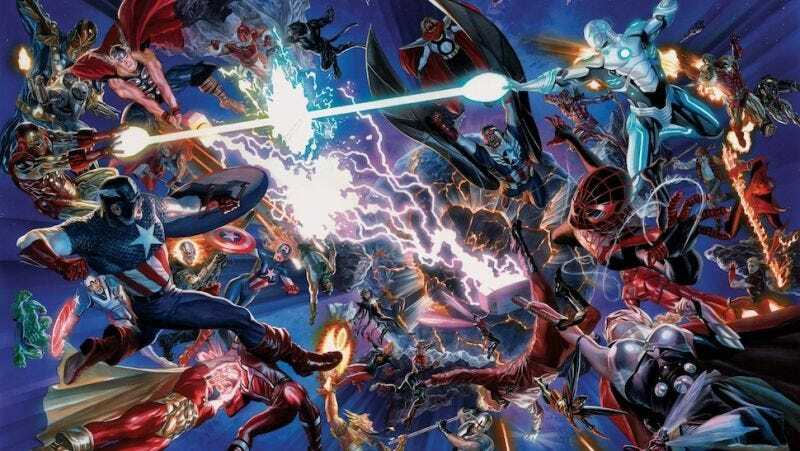 The Ultimate Marvel universe, known as Earth-1610, smashed into the main Marvel Universe, Earth-616, destroying both. Wait a second. What the hell is Ultimate Marvel? Doesn’t that mean the best Marvel? Why isn’t that one the main universe if it’s the Ultimate one!? The Ultimate universe first appeared in 2000, an alternate take on Marvel’s most iconic heroes that updated their origins and stories for the modern day. Peter Parker’s no longer a freelance photographer but the Daily Bugle’s website admin—things like that. The Ultimate universe was one of Marvel’s most popular alternate takes on its heroes, and home to some fantastic characters. Like Miles Morales, who took over from Peter Parker as Spider-Man. So it was a big deal when it ended, seemingly for good, by taking out the prime Marvel universe in a big fiery explosion. Many heroes from the 616 and 1610 Earths survived though, after figuring out there was no point fighting each other and instead getting on some spaceships, hoping to ride out the cataclysm. So where does Secret Wars take place, if the Marvel universe is dead? Remember when I mentioned Battleworld earlier? The Battleworld is a mish-mash of different alternate worlds, smushed together into one. The escape crafts of the surviving heroes crash land there, only to find out each region—populated by alternate versions of many heroes, with recreations of old Marvel events, like Age of Ultron or X-Men Apocalypse, alongside new things like the wild-western 1872—was ruled by the iron fist of Doctor Doom, the God-King of the new universe. Wait. How the hell did Doctor Doom survive? And become god? While the New Avengers were going around being morally problematic in their quest to save the world, arguably Doom tried to be the most noble—in his own, Doom-y way. Victor realized that the Beyonders, godlike beings who played a part in the creation of the Marvel cosmos, were the ones behind the destruction of the alternate realities. Doom, with the help of Doctor Strange and Molecule Man, managed to thrash the Beyonders, hoping that by taking their power he could save reality. He couldn’t, but he used it to reforge the remaining shards of different universes into one single remaining world. Seems kind of benevolent, for a Supervillain. Well, having absolute power let Doom basically create a fantasy world for himself to play about it. The “Baron” of each region of Battleworld had to report to Doom, the ultimate ruler of the world—something Doom has wanted forever—and a man who could reshape reality at the click of his fingers. He commanded an army of alternate Thors to police the world (they were called the Thor Corps. Cute name aside, they were not to be trifled with). He erased the memory of Reed Richards from the mind of Sue Storm and Richard’s children, Valeria and Franklin, and made them his own family, to spite his longtime nemesis. Hell, he even made Galactus his personal lapdog, for christ’s sake. Okay, less benevolent. No one tried to stop him? No—the Thor Corps ensured that there was no travel between different regions of the Battleworld, and after all, Doom had godlike powers. He could do whatever he wanted, and Battleworld was mostly fine to exist with him ruling it all. He did so happily for eight years, until the escape ships containing the survivors of the Ultimate and Prime Marvel universes arrived. Being the superheroes we know and love, they didn’t take too kindly to Victor Von Doom being god. But how do you fight god? Good question. They tried to battle Doom, but with his almighty power they couldn’t beat him. Before he could deal the killing blow that would’ve snuffed out Marvel’s most iconic superheroes, Stephen Strange—who had spent those eight years as Doom’s lackey, believing his closest allies were lost—used his magic to scatter the heroes across the Battleworld, something Doom snapped his neck for. Oh, and he blamed Strange’s death on the heroes, charging Valeria Richards, who still thought Doom was her father, with hunting them down. Okay. But when this Secret Wars thing started, Marvel cancelled a bunch of my comics and replaced them with all these Battleworld comics. What’s the deal with that? With the universe destroyed, those comics couldn’t really continue. Secret Wars was designed to be a total reboot of the Marvel comic universe, something they hadn’t really done on this scale. Its current crop of comics ended, and were replaced by tons and tons of new miniseries that were set in the different regions of Battleworld, exploring these strange places and offering twists on old stories like Civil War or Armor Wars or even things that weren’t wars! Do I have to read all of them to understand Secret Wars then? I don’t have the time, money, or sanity to do that. No one does. If you just want to catch up on the main thrust of Secret Wars, just read the main Secret Wars series, which ran for 9 issues and ended today. Great! So, heroes scattered, Doctor Doom triumphant. What happened next? Were our heroes... doomed? See what you did there. Well, the heroes were scattered, but not broken. They even managed to find regions that were disgruntled with Doom’s long rule, and slowly built an army of resistance that could march upon Doom’s castle in the appropriately-titled region of Doomguard. And Black Panther got hold of the all-powerful Infinity Gauntlet, because how else are you going to fight a dude with the powers of a god? So Doom’s armies fight the heroes’ armies. What about Doom himself? Well, you’ll have to find out by reading the final issue—the heroes and villains of Marvel’s old universe have made their move, and Doctor Doom stands to lose everything he’s made. Suffice to say, it’ll have some big questions about the fate of certain Marvel heroes, especially the Fantastic Four. But this catches you right up, so you can dig in straight away!